A surprise call from our friend’s Gerry and JoAnn B. led to the four of us gathering last Saturday evening at Tre Famiglia in Haddonfield, NJ to celebrate my wife, Kathy’s birthday. We hadn’t seen them since our return from Napa as they were an integral part of our wine country sextet. We had some of the wines that Gerry had bought in Napa with us and I dug up something from my cellar. Gerry had two bottles from Mayo Family. This was one of the places we visited during our week in Napa/Sonoma. The first bottle was the one that was awarded the “Best in Class” Award at this years Sonoma County Harvest Fair. We actually tasted this wine during a visit to that fair back on October 3rd. 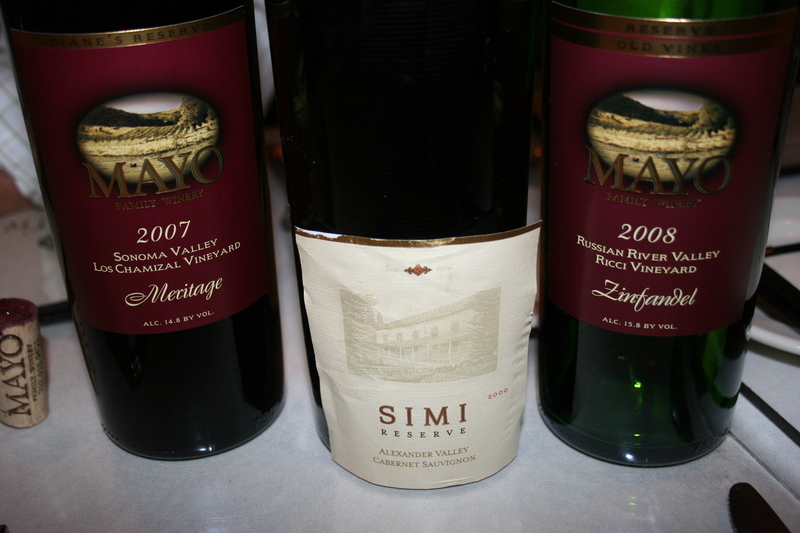 This was the 2007 Mayo Family, Sonoma Valley, Los Chamizal Vineyard, Meritage. This one is a blend of cabernet sauvignon, merlot and cab franc and is a very nice wine at its $30 price tag. It was not Gerry’s favorite, however, that award went to his other wine, the 2008 Mayo Family, Russian River Valley, Ricci Vineyard, Zinfandel. My wife, Kathy, now has company as prior to this, she was our only true, blue zinfandel lover. I have to admit, this one is very tasty and worth the $50.00 price tag. My contribution, which I thought finished third on this evening, although I think Gerry preferred it to the “Meritage”, was the 2000 Simi Reserve, Alexander Valley, Canernet Sauvignon. This 10 year old cab took some time to open up but when it did it had a nice array of black fruits with smooth tannins and some chocolate notes on the finish. 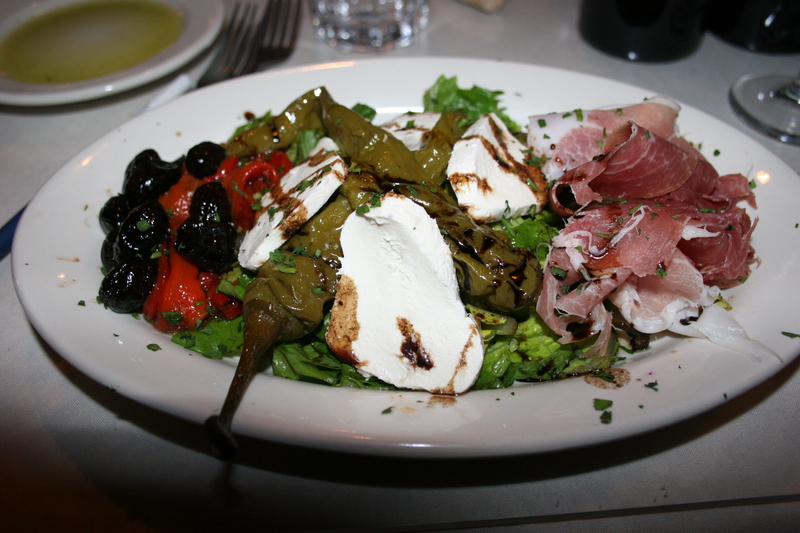 Kathy and I have been to Tre Famiglia a few times and I reviewed it very favorably on our last visit in May. At that time we had a nice round table in the side room. Gerry and Joann are from the western suburbs of Philly and this was their first visit to this classy Italian bistro (can a bistro be Italian?). Tonight we were seated in tight quarters. It was a Saturday night and the restaurant was packed. 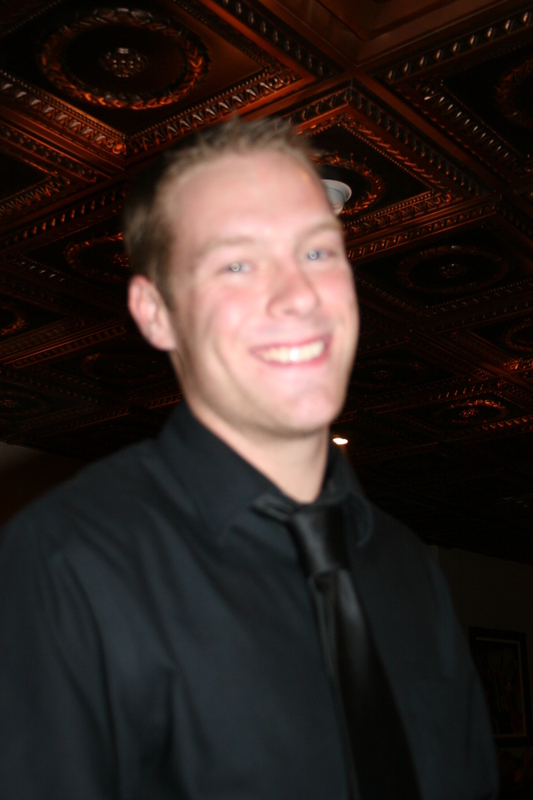 Our server, Joseph, recited a laundry list of specials that may have included more items than the actual menu. I have to confess that in the beginning I felt rushed. We had a lot to talk about. I had pictures to show them from the trip and it just seemed we were hurried to place our order. The feeling went away as the night progressed and it may have just been an unwarranted notion on my part. 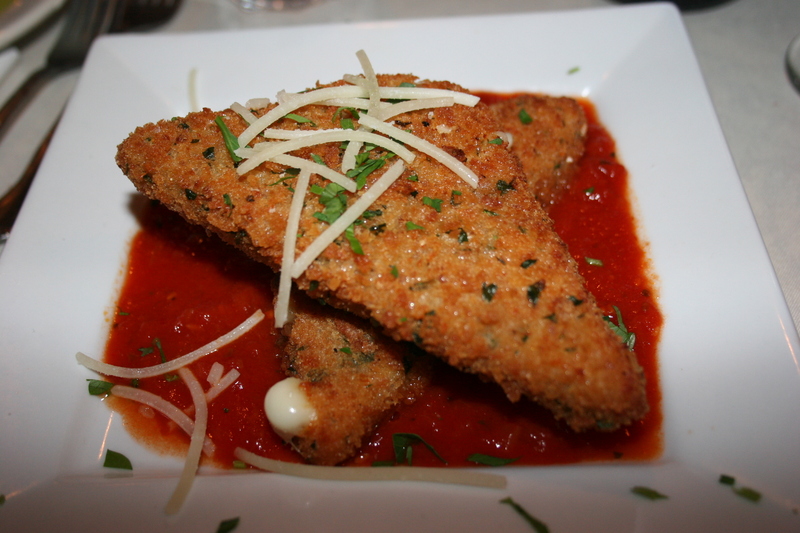 With so many choices I chose the Mozzarella Fritti, Panko breaded wedge of mozzarella, pan seared on a bed of pomadoro sauce. 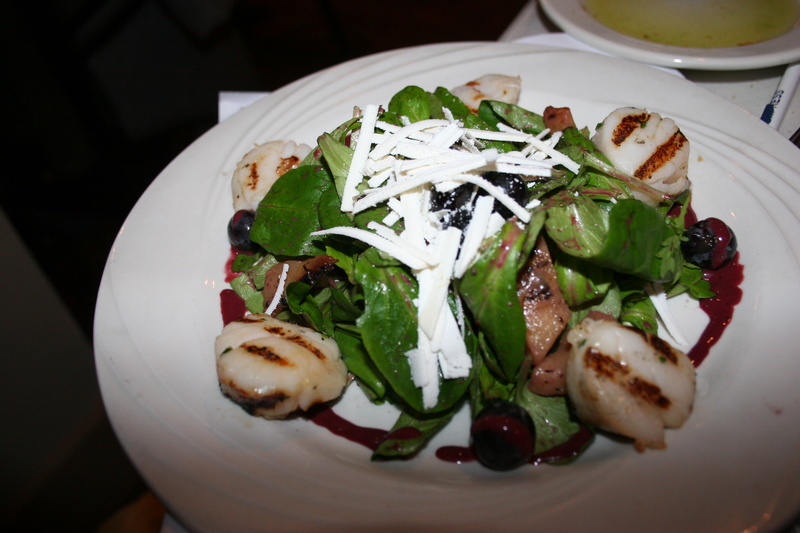 One word….DELISH! Great texture and lots of flavor. This was not your usual fried mozzarella sticks. 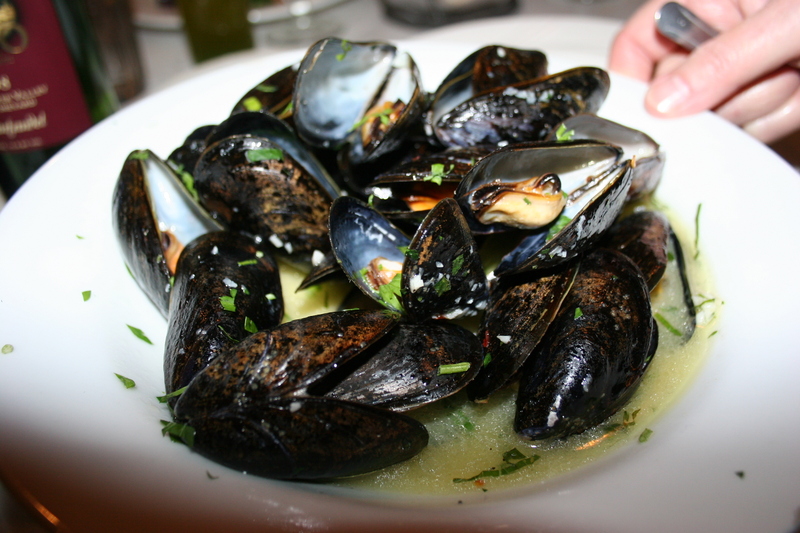 Kathy had the Mussells Possilippo, steamed in a white garlic sauce. I don’t think Kathy has ever met a mussell she didn’t like and these were pretty good. Gerry ordered something from the “special appetizer” list and it appeared to be a charcuterie type of dish with some tomatoes, olives, red peppers, mozzarella, and prosciutto on a bed of arugula. This looked like a nice presentation and a great way to start off his meal. 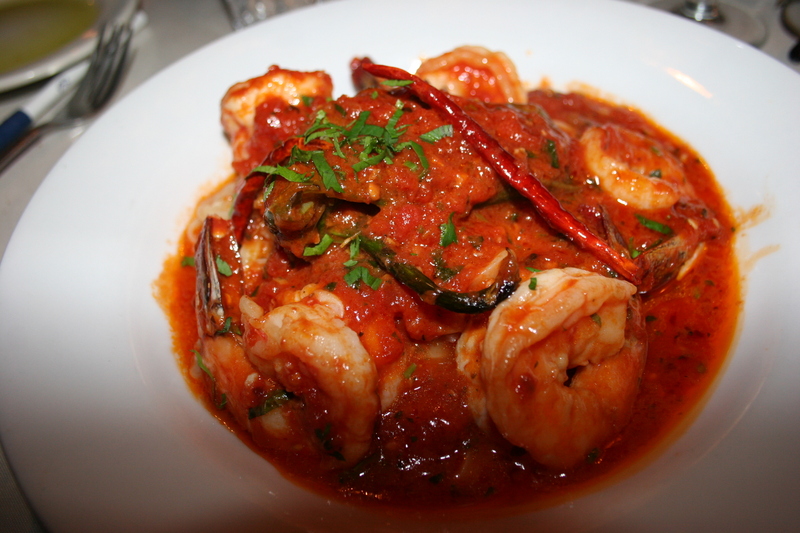 Gerry had the Shrimp and Pasta Fra Diavolo. This was a perfect match for his zinfandel with nice big pieces of shrimp in a tangy sauce. 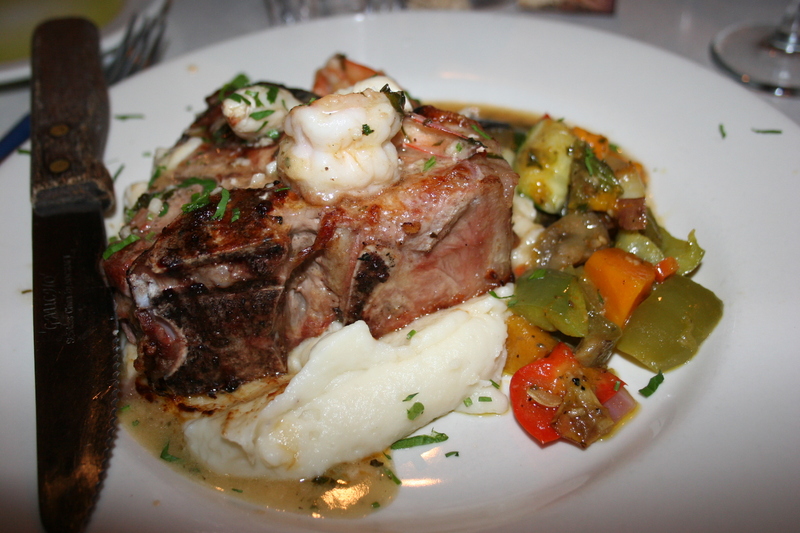 Joann had the veal chop Porterhouse topped with shrimp and crabmeat and served over black truffled red bliss mashed potatoes and veggies. 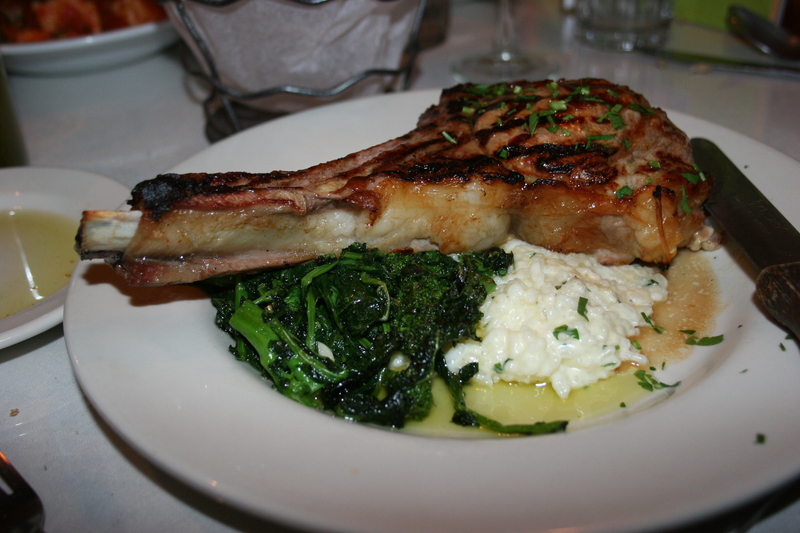 Kathy also had a big veal chop. Hers was char-broiled and served over a bed of polenta with a side of broccoli rabe. She finished as much as she could and, lucky for me, there was enough left over that I was able to combine my leftovers with hers for another meal on Monday evening. 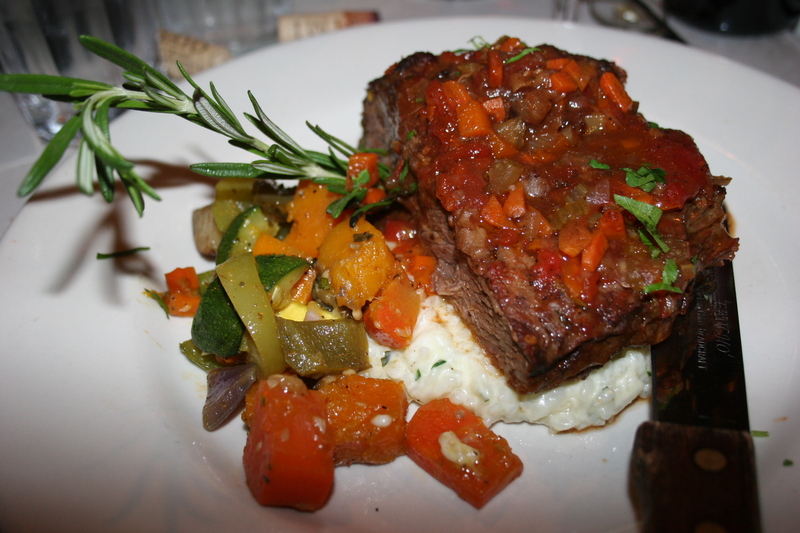 I had the Braised Short Ribs which was also served over polenta with a side of veggies. The meat was very tender. Perhaps, not quite as flavorful as I would have hoped, but still very good. The fact that we saved half our meal left us room for dessert. 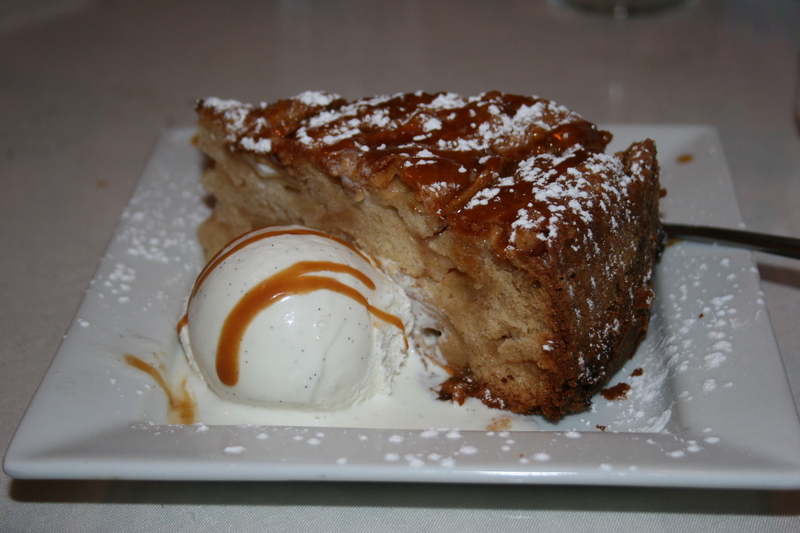 Kathy had the Apple Cake with Vanilla Ice Cream. Looked good. Tasted good. 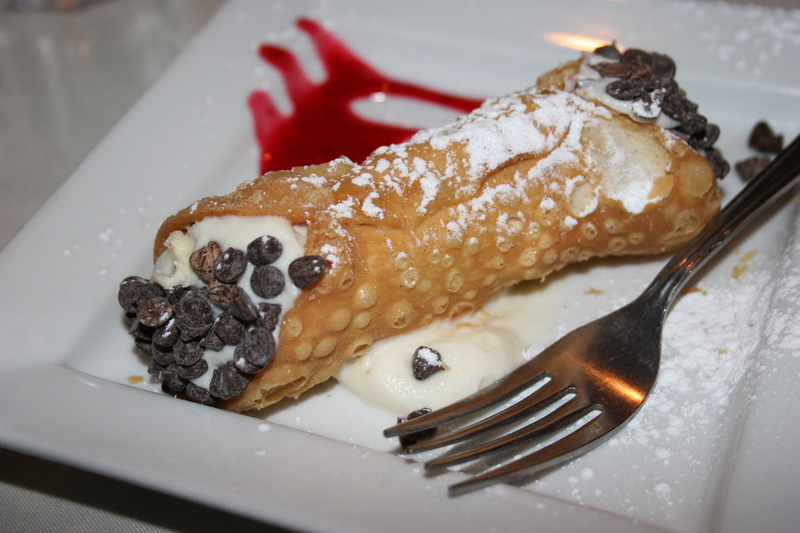 Gerry had the Chocolate Chip Cannoli and, unlike the last one we had, this one had plenty of chocolate chips. 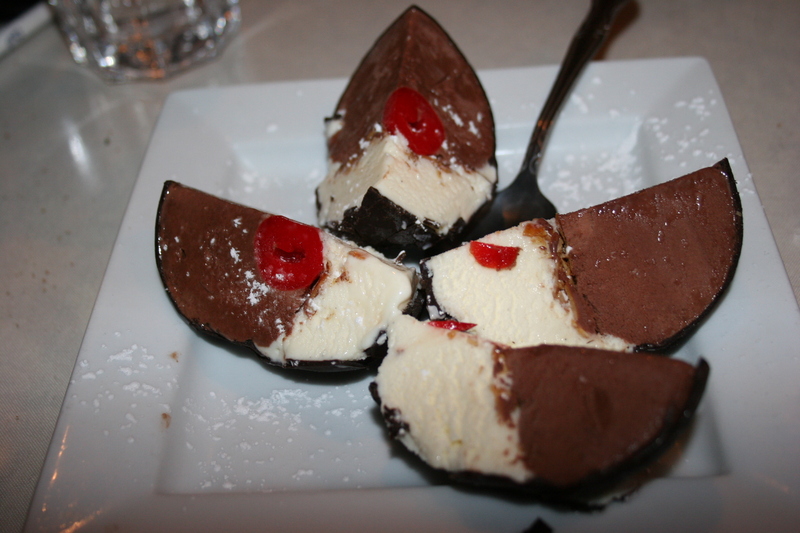 Joann had the Chocolate Tartufo, the familiar hard shell chocolate with vanilla/chocolate gelato and a cherry in the middle. It’s one of those desserts that is impossible to screw up because ALL the parts are great. 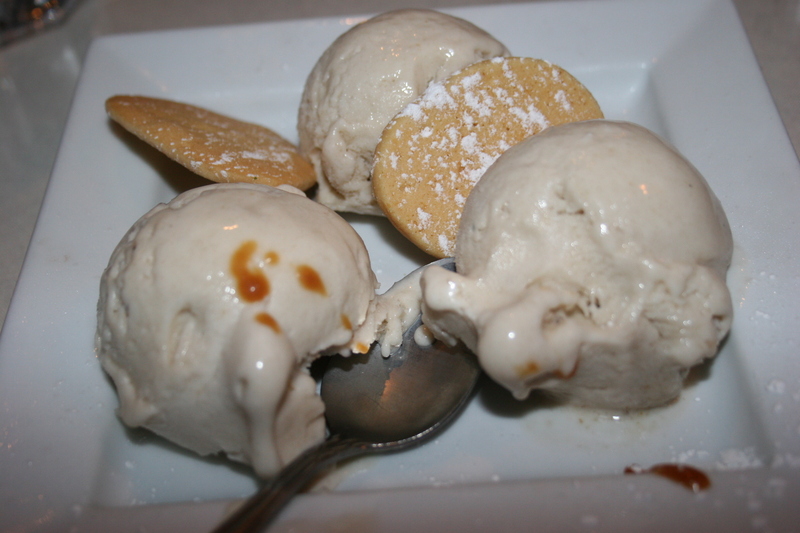 I had a simple dish of banana gelato with crisp sugar cookies. It was good but it was too much banana. I should have ordered the Tartufo! Overall, it was a nice dinner experience and Joseph was kind enough to write out the specials so that I wouldn’t draw a complete blank without menu support to help me when I wrote this review. 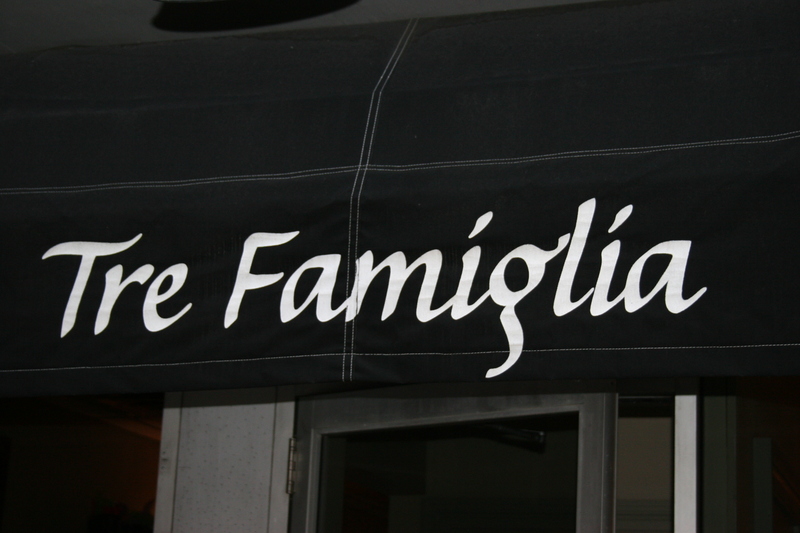 Tre Famiglia has a nice following and it’s one of those places where you can always count on a good meal.